The Latest Update to the 2019 Edition of The Best-Reviewed Disney World Guide Book Is Out! 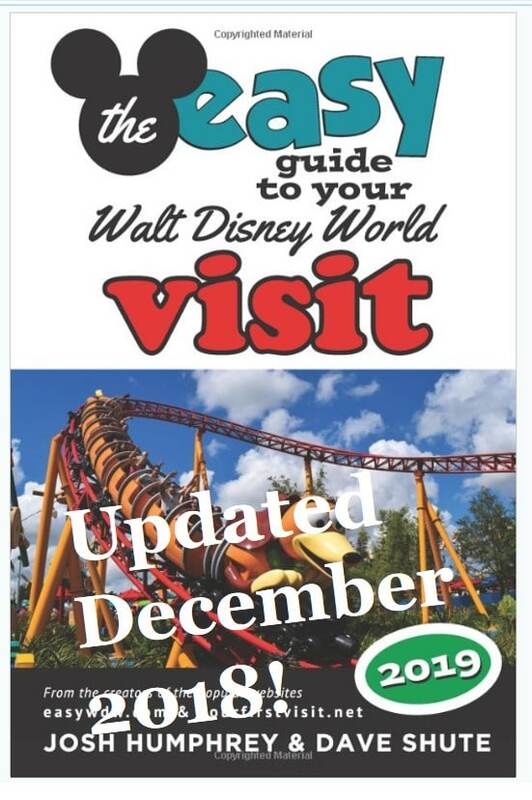 Josh (of easyWDW.com) and I have just released (on Amazon, through Theme Park Press) the latest update to the 2019 edition of the best reviewed Walt Disney World guide book, ever, The easy Guide to Your Walt Disney World Visit 2019. We did more than 30 pages of changes for this update—but probably the most important change is that our material and advice now fully incorporates Disney World’s new date-based ticket pricing approach. Other changes worth noting: all the recently-opened stuff at Caribbean Beach is covered, and there is a minor change to Day Two of the Character-Centric Two Day Touring Plan for Magic Kingdom. If your Disney World guidebook does not know about lunch at Centertown or about the exact new model for ticket pricing and what it means for you, then cast that weak stuff aside and get our book! Chock full of great advice for both returning and first-time visitors, the 2019 edition continues our tradition of offering the best, clearest, shortest, and wisest advice for your Disney World trip, ever. 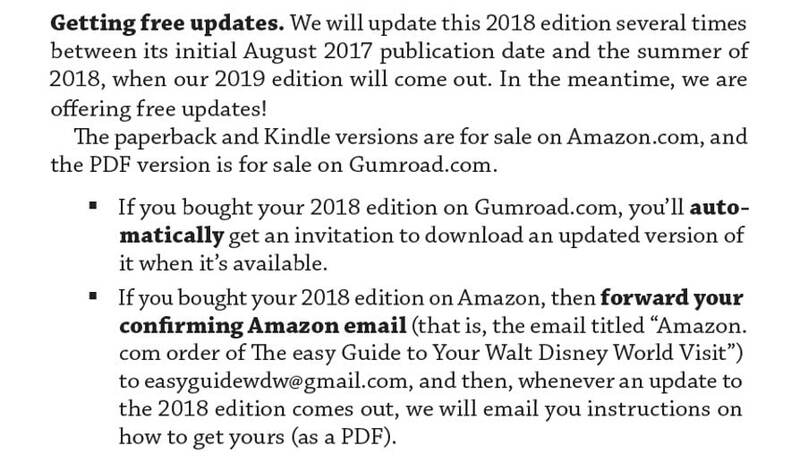 It also continues our model of offering a free Kindle version to those who buy the paperback edition, and of free updates* (as PDFs) over the course of 2018 and 2019 (until we publish our 2020 edition), because Disney World changes faster than any guidebook on solely an annual publishing calendar can respond to. I’ve already emailed those who have already signed up for getting the updated version of the book (unless I messed up). For those who bought the 2019 edition but have not yet signed up for their updates, see the instructions you’ll find on page XII. No other guide book can claim to be the best-reviewed, ever, because no other guide book is as good as The easy Guide to Your Walt Disney World Visit 2019! Click the link to get yours today! 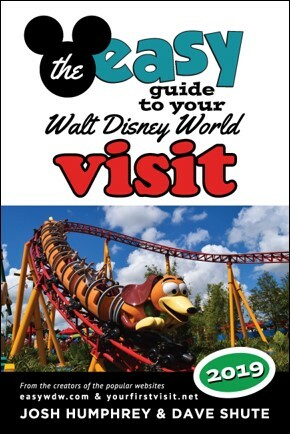 Josh (of easyWDW.com) and I have published (on Amazon, through Theme Park Press) the 2019 edition of the best reviewed Walt Disney World guide book, ever, The easy Guide to Your Walt Disney World Visit 2019. With Star Wars opening and new ticket pricing models, 2019 will be an interesting year. But you could be in no better hands than me and Josh. Josh is the best in the world on how to tour the parks and on dining at Disney World; I am the best in the world on the Disney World resorts, and between the two of us, we collectively are the best in the world on when to go. Our Disney World guide book series began in 2014, and since then has received hundreds of reviews on Amazon, 90%+ of them five stars. No other guide book can make this claim, because no other guide book is as good as The easy Guide to Your Walt Disney World Visit 2019! Click the link to get yours today! Josh of easyWDW and I, co-authors of The easy Guide to Your Walt Disney World Visit, will be meeting and greeting and signing copies of our books (or someone else’s book, or your T-shirt, we’re easy) on Saturday, April 28, 2018. We’ll be at Epcot, on and outside of the Mexico pyramid to the right, from roughly 1p to 2p. …into the best-rated Disney World guidebook series ever published (our Disney World guidebooks have had almost 300 reviews on Amazon, of which 91% have been 5 stars). There’s not a better way to spend an afternoon hour on Saturday than reading our book. But if you are at Epcot instead, come on by–we’d love to meet you and thank you! Amazon has released the updated version of my and Josh’s The easy Guide to Your Walt Disney World Visit 2018, the latest edition of the best-reviewed Disney World guidebook in history. We first published the 2018 edition in late August 2017, updated it in November, and updated it again with almost 50 pages of changes in early March 2018. If you bought the 2018 edition you get this update (as a PDF) for free! If you’ve already sent in your email, we’ll start sending instructions on how to get the updated PDF this week. And if you haven’t bought it yet, what are you waiting for? We’ve had almost 300 reviews of this Disney World guidebook series on Amazon, and more than 90% are five stars. 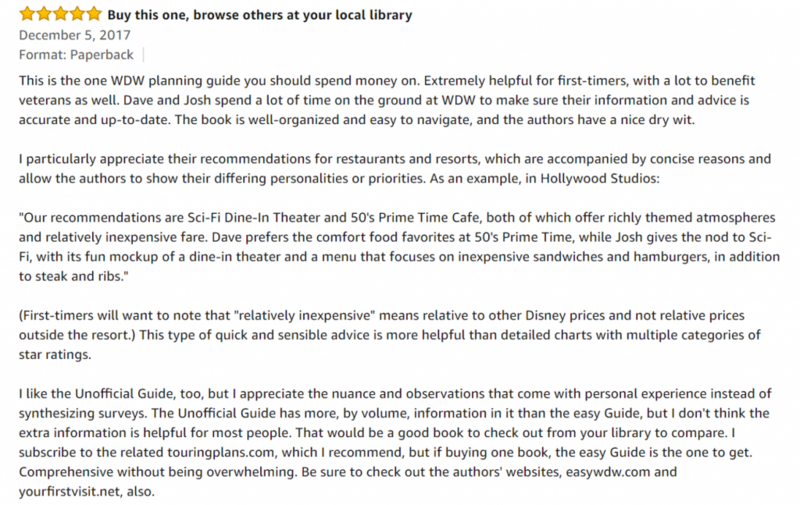 You won’t find more informed, more thoughtful, more experienced, more judicious or more silly companions to the Disney World parks, resorts, or dining venues than me and co-author Josh. 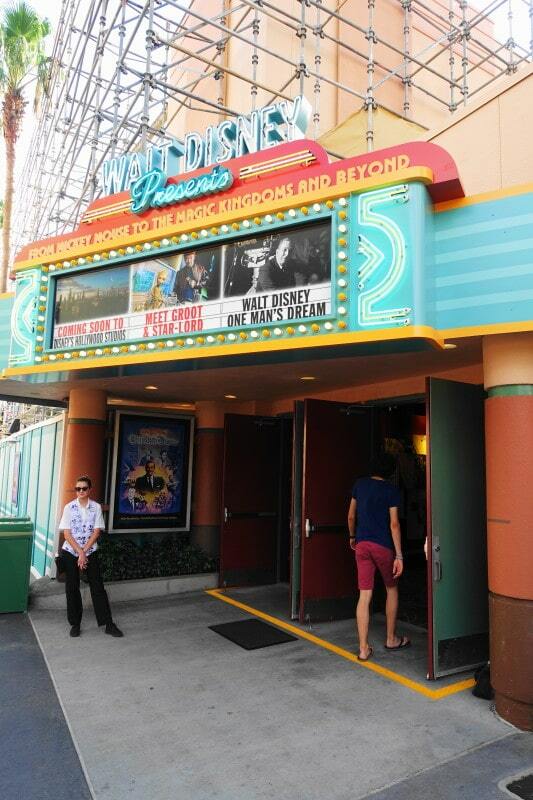 Ours is the most accurate and most up-to-date Disney World guidebook you can find. Chapter 1 has three purposes: introduce the rest of the book, summarize our recommendations for first-timers, and indicate what’s new for returning visitors. The only material change here was the upcoming closure of the Children’s Activity Centers. We went to press before the Pixar thingy at the Contemporary was announced. The prices in this chapter are updated to reflect the ticket prices that came out in February. In some cases, the cost of adding a day actually went down. Little changed in this chapter—we went to press after the start date for the Epcot International Food and Wine Festival (August 30) was announced. We revised the To-Do lists in this chapter to reflect the addition of more hotels to 60 day FastPass+ eligibility. We made no significant changes to this chapter, as the places to go next remain easyWDW.com and yourfirstvisit.net! We pride ourselves on having the most accurate and up-to-date guidebook available, and updates like this are what make that come to life! Already have yours? Then write us a five star review on Amazon! 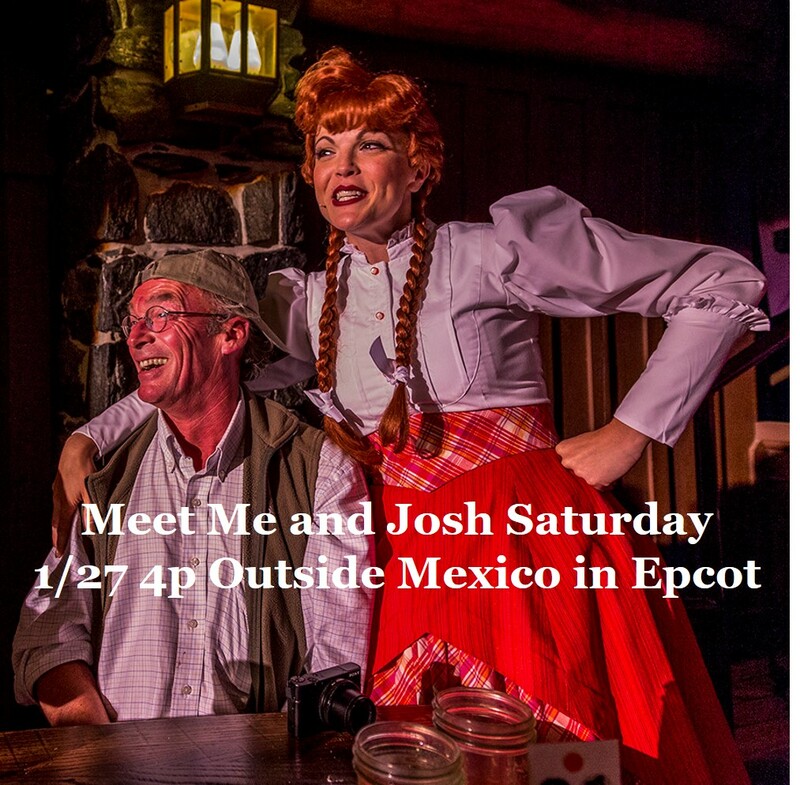 Josh of easyWDW and I, co-authors of The easy Guide to Your Walt Disney World Visit and sometimes stars of Hoop-Dee-Doo, will be meeting and greeting and signing copies of our books (or someone else’s book, or your back, we’re easy) Saturday January 27. We’ll be at Epcot, on and outside of the Mexico pyramid to the right, Saturday 1/27/2018 from roughly 4p to 5p. 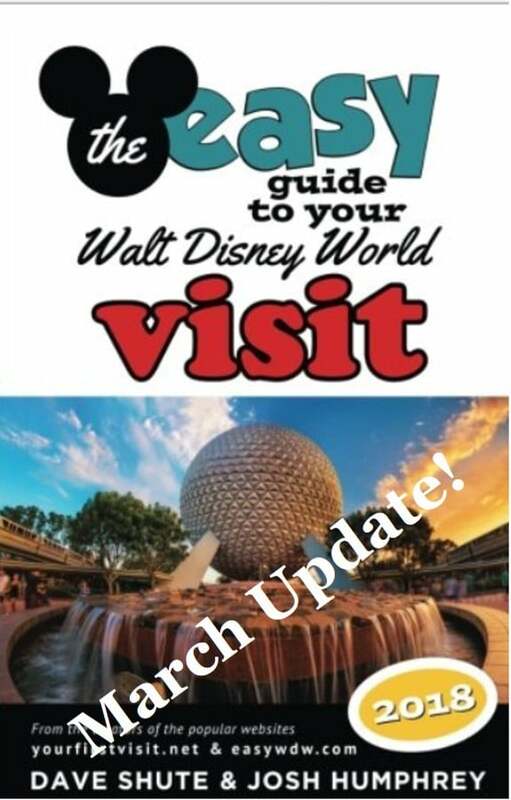 As noted yesterday, Josh and I just published an update to our The easy Guide to Your Walt Disney World Visit 2018, the best-reviewed Disney World guide book in the known universe. We’ve added the new dog-friendly pilot to the four resorts it affects. We updated the construction and/or refurb status of the moderate resorts and of Pop Century and the Yacht Club, and added the new Yacht Club floor plan. Thanks to reader feedback, we fixed a few errors or omissions that had crept in—the height minimum in Rock ‘n” Roller, a place where we had left out tiering at the Animal Kingdom, and a point about crowd calendars. At the Studios, we’ve updated the names of one attraction (Walt Disney Presents) and of one of the lands (Grand Avenue), added BaseLine Tap House, updated the FastPass+ priority order, and added Jingle Bell Jingle BAM! At Magic Kingdom, we revised the time of the Afternoon Parade and update the touring plans to reflect it. We pride ourselves on having the most accurate and up-to-date guidebook available, and updates like this are what make that come to life!